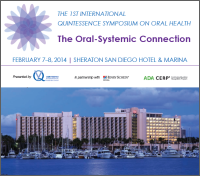 It is with great pleasure that I invite you to attend the 1st International Quintessence Symposium on Oral Health: The Oral-Systemic Connection in San Diego, February 7-8, 2014, at the Sheraton San Diego Hotel & Marina. This unique gathering will bring together the most prominent clinicians and researchers in the field of the oral-systemic connection. Over the past several decades, an impressive body of knowledge has accumulated about the impact of oral infections on overall health and well-being. Studies have found important associations that are now being evaluated for causative relationships. New information is being published at a rapid pace, and clinicians must sort through sometimes conflicting published findings. This symposium provides an opportunity for participants to hear the latest scientific information on the associations between oral diseases and health and learn how to interpret claims made by scientists working on this subject. I am confident that this symposium will bring clarity and understanding to a subject of utmost importance to all health care professionals. Not only will you benefit from the knowledge gained from the gathered experts, but you will also be able to apply this knowledge for the benefit of your patients. I look forward to welcoming you to San Diego and the 1st International Quintessence Symposium on Oral Health: The Oral-Systemic Connection.